* Share price as of closing on July 1, 2014. Number of shares outstanding as of most recent quarter end excludes treasury shares. ROE and BPS are based on actual results of the previous term end. This Bridge Report provides information about Japan System Techniques Co., Ltd., including a review of fiscal year March 2014 earnings. Individualized contracted software development, sale and related services of operational reform packages for schools, IT equipment sales and IT/telecom infrastructure construction, and automated health insurance claims check services provided within the medical big data business accounted for 65.7%, 18.0%, 14.1%, and 2.2% of fiscal year March 2014 sales respectively. In accordance with this basic policy, JAST endeavors to maximize value for its customers, shareholders, employees and society and has established a goal of realizing stable growth by creating a "win-win" relationship with each of the four stakeholder groups. Furthermore, information services for each and every employee that is the driving force of growth is a service provided to customers with the utmost integrity (sincerity). Also JAST views training of human resources as a crucial area where investments must be made. This belief in the formation of highly trained "individuals" is a core management philosophy. JAST is able to provide services freely to a wide range of applications due to its independence from large corporate groups which would restrict its business activities. JAST's main businesses include the following four segments. However in recent years the Company has endeavored to expand JAST brand services and raise their share of total sales. Specifically, "JMICS (JAST Medical Insurance Checking Service) medical information (health insurance claim automated inspection) services, "BankNeo" bank CRM solutions services, and "Kyoto Zen Temple Tour" smartphone applications are amongst the JAST branded products and services. JAST boasts of a long track record with some of Japan's largest corporations including Fujitsu Limited (Direct transactions for 37 years), Panasonic Corporation (32 years), and IHI Corporation (32 years). Furthermore, the business transactions with these major corporations have been conducted directly, without having to go through intermediary companies. Because the transactions have been conducted over long periods of time, JAST has become a "core partner" of many of these companies, and it has been able to secure a relatively stable amount of orders even during periods of economic weakness. At the same time, the concentration of sales to the eight main long term clients had been as high as 80%, but has now fallen to 40%. Furthermore, the number of new clients has grown as shown in the table below. 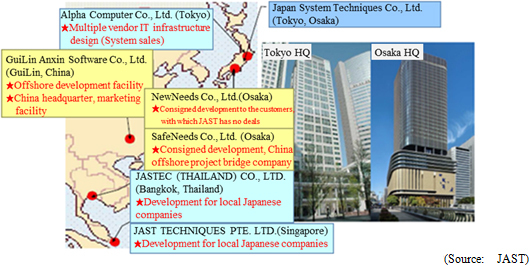 JAST is noted for its corporate structure with two headquarters located in Tokyo and Osaka, and its early facilitation of overseas development facilities. Furthermore in August 2006, an expansion in the university market with expanded services in the education realm was undertaken, with a focus upon large universities in the Tokyo metropolitan region. As part of this expansion, all of the shares of Alpha Computer Co., Ltd., which boasts of a strong track record in sales of system related equipment, were purchased. Consequently, the large scale deployment of system integration business (SI business) including the provision of packages, information equipment, and networks has become possible. In addition, JAST Medical Insurance Checking System (JMICS) has been spun off as a separate business entity, and JAST acquired 3.66% of the total shares issued by ODK Solutions Co., Ltd. for cooperation designed to expand both companies' businesses in the realm of education in July 2013. The integrated packaged software that provides management reform solutions for universities has been implemented at 341 universities (As of May 19, 2014) since its launch in October 1994, and has come to be regarded highly by the educational institution market. In particular, JAST's packaged software covers a wide range of operational functions in a wide range of applications from large comprehensive universities to smaller junior colleges. Furthermore, simple setting of parameters by universities allows the packaged software to be used flexibly. In other words, this software's lack of any need for customization contributes to reductions in overall user costs, including both implementation and maintenance costs. The implementation cost ranges between ¥100,000 to several hundreds of millions of yen. As a strategy for dealing with the declining birthrates and aging population, most all universities are endeavoring to improve their management quality and student services in order to acquire superior students. However, the majority of the some 1,200 universities nationwide, including four year colleges and two year junior colleges, still primarily use systems and packaged software that have to be customized to match main frame technologies. Consequently, JAST's products are superior in both quality and pricing. Sales and profits rose from the previous term and remained basically in line with estimates. Projects provided to service / retail industry and manufacturing industries increased, allowing both sales and profits to grow. Sales growth was achieved despite intensified competition, but increases in research and development costs for next generation products caused profits to decline. The arrival of a seasonally weak period of orders for equipment from universities, both sales and profits declined. In addition to automated health insurance claims check services, fortification of notification and data analysis services allowed the number of contracts to steadily expand, in turn allowing sales and profits to grow. Increases in cash and deposits, and receivables contributed to a ¥432million increase in current assets. At the same time, increases in depreciation and amortization were offset by increases in software and allowed non-current and total assets to rise by ¥335 and ¥767 million respectively. A decline in short term debt was offset by increases in retirement benefit provisions, allowing total liabilities to rise by ¥190 million. Consequently, equity ratio rose from 55.0% at the end of the previous term to 56.6% at the end of the current term. A large increase in bonus reserves was offset by declines in accounts receivables, inventories and accounts payables, allowing the margin of net inflow of operating cash flow to increase by ¥211 million in the previous term. A decline in payments to acquire tangible fixed assets and recovery of security deposits allowed the margin of net outflow of investing cash flow to be reduced by ¥435 million from the previous term. Issuance of stocks contributed to a ¥295 million improvement in financing cash flow from a net outflow in the previous term to a net inflow in the current term. Cash at the end of the current term rose by ¥534 million from the end of the previous term to ¥2.144 billion. Japan System Techniques' estimates call for sales and ordinary income to rise by 9.9% and 17.1% year-over-year to ¥11.9 and ¥0.555 billion respectively during fiscal year March 2015. While costs including research and development are expected to increase, improvements in profitability of new projects are expected to allow profits to increase along with sales. The details of operating income are described below. The main cornerstones of the package business include 1) comprehensive education information technology business development, 2) next generation product development, and 3) China business deployment. 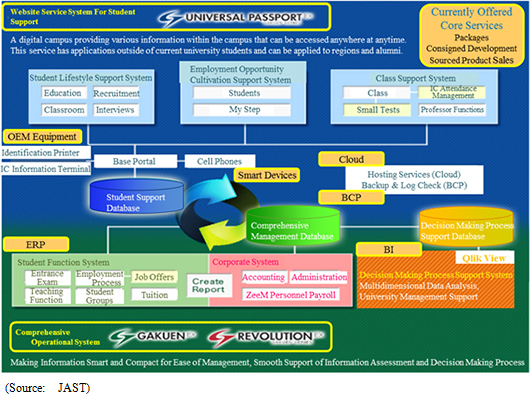 This business spans a wide range of different services including the student support system "UNIVERSAL PASSPORT" provided over the web, comprehensive system "GAKUEN," cloud "REVOLUTION," smart devices, and BCP. 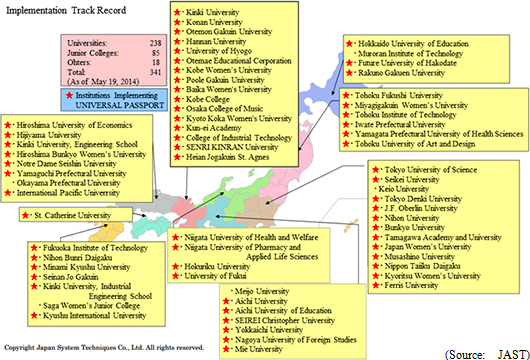 The current "GAKUEN EX Series" was released in September 2006 and the versions GAKUEN and UNIVERSAL PASSPORT have been introduced at 151 and 127 universities respectively, making this series of products the top brand of university management solutions. While pricing competition has intensified with the appearance of competing products, Japan System Techniques has been able to maintain profitability on this product at the expense of sales growth, which is declining. Therefore, JAST has chosen to renew this series of products improving its function, design, ease of use, services provided, and platform capability rather than simply upgrading the previous versions. In addition, development costs have been reduced to below a third of the initial versions. The new versions are created not as mere responses to competing products, but are designed to provide optimized solutions that take the future vision for and environment in which universities operate into consideration. From March 2014, prototype development has been conducted, with additional components and related comprehensive services expected to be released as they are developed, with full scale sales contribution expected from fiscal year March 2015 onwards. Sales of next generation versions of packaged products are expected to exceed current versions in fiscal year March 2018 and to eventually grow to over ¥2.0 billion. Along with the entry to the Chinese market, Safe Needs Co., Ltd. was turned into a subsidiary, and GuiLin Anxin Software Co., Ltd. will become a strategically important company. From a technological perspective, GAKUEN was turned into a product with strong potential through the combination of know-how cultivated in Japan and localization by Chinese system engineers based upon the differences in language and university systems of the two countries. In particular, the ability to use proper Chinese has been provided, making it possible to achieve compliance with the Chinese university system requirements and to provide an optimized platform that has been adjusted to match the Chinese market. With regards to marketing, JAST believes that the difficult problems it encountered when it first entered the Chinese market have now been overcome. The Company has secured sales facilities operated by Chinese within China, and maintains staff that can get in touch with key persons of clients in China directly. Moreover, the product line offered by the Company is a result of cherry picking of the two: highly reliable products "Made in Japan" and ones "Made in China," which have other strengths. An agreement for the university informatization has been signed with Huzhou Teachers College (Huzhou, Zhejiang Province) in May 2013. In addition, a sales facility has been established in the Shanghai Special Economic Zone in January 2014, and the e-Learning system "GAKUEN EduTrack" was released in April 2014. BankNeo is filled with optimized functions based upon development know-how accumulated in the long years of service provided to the finance industry including interface function for electronic maps, connectivity with mobile terminals, and leading edge CRM/SFA solutions. At the same time, JAST has achieved both short implementation times and low pricing, which are highly unusual for large financial systems, and their track record of implementations is growing rapidly. 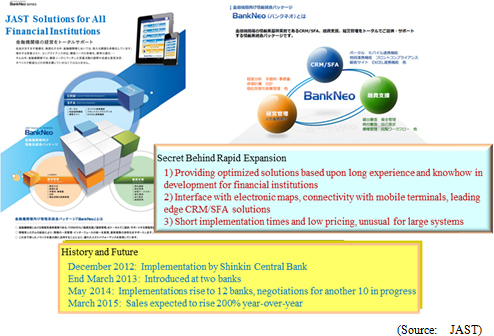 After the first implementation at the Shinkin Bank in December 2012, two other banks introduced this system by the end of March 2013, with the number of decided implementations rising to 12 as of May 2014. JAST is currently conducting negotiations with 10 banks, and sales of this system are expected to rise by over 200% year-over-year during fiscal year March 2015. 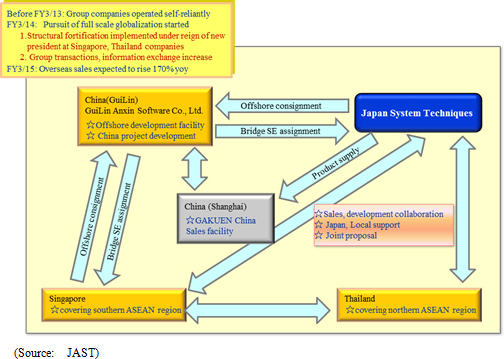 Prior to fiscal year March 2013, the various companies of the JAST Group had operated on a self-reliant basis, but structural fortification was conducted under the leadership of new presidents at the Singapore and Thailand companies in fiscal year March 2014 and transactions and information exchange increased. Consequently, JAST is now pursuing a strategy of full scale globalization and its overseas sales are expected to grow by 170% year-over-year in fiscal year March 2015. "Vender cloud" that can be used by various inspection and analysis companies was started in October 2013. In January 2014, the monthly insurance claims processed exceeded 2.50 million, and have risen by three fold in the course of just one year. Sales during fiscal year March 2014 doubled from the previous term to ¥230 million, and while the operating loss improved, anticipatory investments are still being made. Sales are expected to rise by 170% year-over-year during fiscal year March 2015, and operating losses are expected to contract by a large margin on the back of reductions in fixed costs through the use of satellite offices, and improvements in efficiency of inspections and reporting. From September 2013 onwards, the exercise of subscription right to shares has progressed rapidly along with an increase in trading volumes. Furthermore, two off-floor trades (Maximum limit of 200 shares) were sold immediately, and a move to the first section of the Tokyo Stock Exchange may be imminent. A dividend of ¥25 per share is expected, and other measures are being considered to increase liquidity of its shares in the market. The JAST brand of products and services ranging from consigned development of systems to its own packaged software is expanding. In particularly, expectations of strong contributions to earnings in the future are being placed upon the "medical big data business." As of May 2014, the number of organizations to which the health insurance claims check services were provided grew by 34 to 52, and the range of services and products including analysis and cloud services is expected to grow and allow the Company to firmly establish its medical analysis business. Profitability of this business may be achieved as early as fiscal year March 2016 given the current efforts to increase productivity and reduce fixed costs. New business opportunities are also expected to appear based upon JAST's ability to accumulate big data through its dealings with health insurance association clients. Solutions provided to universities within China based upon know-how in the educational IT service developed within Japan are expected to become a new growth driver. Furthermore, the structural shift from consigned services business to the establishment of its own branded products and services business is being promoted at a fast pace.